Battling brothers are nothing new in rock & roll. They are part of a proud tradition of dysfunction in some great bands, ranging from Ray and Dave Davies' long-running feuds that split The Kinks to the sneering mutual disgust of the Gallagher brothers that took down Brit-pop heroes Oasis. Redemption stories of brothers putting aside their differences for the sake of family—and great music—are a rarer thing. 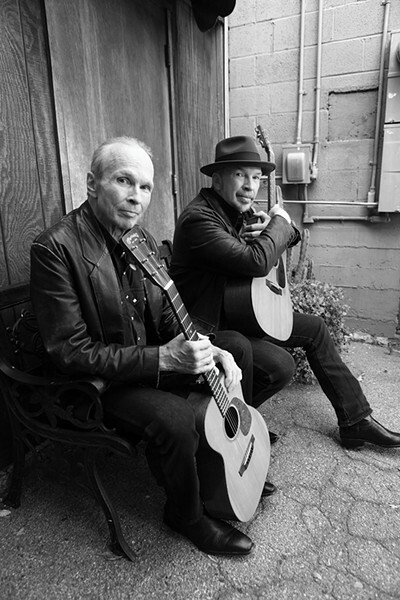 But that's just the story that roots-rockers Dave and Phil Alvin are writing, three decades after the somewhat acrimonious split of the original lineup of The Blasters. Los Angeles scene cohorts in the early '80s of bands like X, Black Flag and The Germs, The Blasters always stood out, thanks to their love of classic blues and rockabilly, Dave Alvin's stinging guitar playing and older brother Phil's distinct voice, an instrument that evoked singers from decades before his time. The band got some love from music critics and fellow musicians—in one month, they played gigs with the diverse likes of New York punks The Cramps, Texas honky-tonkers Asleep at the Wheel and British stadium royalty Queen—but never broke through commercially to the satisfaction of their record label. Frustrated by their lack of momentum, the band frayed in the mid-'80s, with Dave splitting to join X briefly before launching a successful solo career, and Phil forging on with various lineups under The Blasters' banner. A health scare during a European tour a couple years back was the trigger for the Alvin brothers to record together for the first time since 1985, using the songs of their shared teenage favorite Big Bill Broonzy to create 2014's self-released Common Ground. The recording process and subsequent tour were so harmonious—a rarity in the creative relationship of the two brothers—that joining forces again for another album seemed obvious. In a phone interview, Dave said that throughout the Common Ground tour, fans asked what artist would be next for the Blasters brothers to tackle in the studio. The answer arrives Sept. 18, with the release of Lost Time (Yep Roc Records), a collection of 12 classics from artists including Big Joe Turner, Leadbelly and James Brown. Choosing the songs, Dave says, was a matter of just remembering where his brother was coming from all those years ago when the Blasters were young, blues-loving punks making a scene. "When [Phil] was a teenager, he had a really good blues band. A couple of these songs were in their repertoire, and I really wanted to put a feature on my brother's vocals," Dave says. "I wanted to capture his voice, because I really think there aren't many voices like his. And it's taken me a long time to appreciate that. Especially in roots music, there tends to be two or three types of voices, and he's got a voice that's from another time." Hearing Dave deliver lead guitar parts that cut through the sound of his Guilty Ones—who serve as the brothers' backing band on the albums and on tour—is not surprising, but hearing Phil take on a soul classic like James Brown's "Please, Please, Please" will make fans old and new sit up and take notice when they hear it. Approaching a familiar favorite like that one is not something the Alvin brothers did without trepidation. "Cutting that was interesting, because you approach a James Brown song sort of like you approach a hillside of snakes," Dave says. "And he does a pretty damned good version! [Phil] had done some amazing vocals back in our time together in The Blasters, but this stuff overall is just, 'Ho, wow!' And I think some of that 'Ho, wow!' spirit carries over into the actual tracks of the record, because he's sort of leading the band, and the intensity of how the musicians are playing is all based around his voice. He pulled it off. He got up the hill through the rattlesnakes." For fans of The Blasters, or of either Alvin's work in the years since the original lineup split, both new albums are vivid reminders of how potent the brothers can be when they work together. Dave acknowledges that doing albums of other folks' songs helps keep the creative tension that overwhelmed the brothers years ago at bay. "Maybe if I had written 10 or 12 songs for him to sing, the recording would not have gone as smoothly as these last two have gone," he says. But getting the chance to perform together and hang out regularly for the first time in decades has been good enough to get him thinking about potential projects after Lost Time. "Maybe—maybe—we could do another four albums of this," Dave says. "And maybe—maybe—we'll do an album of songs that I write. Maybe. "I'm enjoying playing music with my brother, as the [album] title implies. I'm trying to make up for more than 30 years of not recording together or playing together, sort of make up for lost time since we were little kids."